With Secret Wars in full force and a million tie-ins all drawing from popular events and periods of the Marvel universe, many people are pining for more solid regular storylines with real characters and arcs. The tendency to crossover can often undermine comics that stand well on their own, and this is especially true when it comes to mega-events that can literally interfere with comics that you are reading. While Marvel is definitely focused on things like the new event as well as popular franchises like Avengers, there are a lot of comics that are really standing out on their own even if they are not pulling in high sales numbers. These are the top five Marvel comics that you should be reading, regardless of whether or not you are trying to engage with Battleworld. This is on the back of the list for two primary reasons. One, the newest run is just not quite as great as Thord: God of Thunder, mainly because they keep focusing on the unveiling of the new Thor and do not let her jump into the mythological aspects of the character more. Second, most people are already on board with this. All this being said, Jason Aaron’s take on Thor has been incredible from start to finish. Drawing on the Eddas and the Sagas, he tells a story that blends Thor’s interaction into the superhero world seamless from his mythological standing on Asgard. The new Thor brings in a female character, yet maintains the character of Odinson, which is a great duality. Stick with this series through Battleworld and hopefully we come out the other side. This new comic from Jeff Lemire had a strike against it right from the start since it was swimming in the wake of Fraction and Aja’s groundbreaking work on Hawkeye. He was set with doing something really difficult with All-New Hawkeye, which is essentially take the basic character set from one series and then do something fundamentally new and different with it. Lemire takes up the challenge and ends up really standing out on his own by creating a series that is almost as good as its predecessor. The series, only at its third issue as of the time of this writing, tells a dual story of how Hawkeye began in his childhood and with a regular contemporary storyline. The past story is told with rich watercolors, while the modern tale actually finds its own interesting space with a style that references Aja’s work without copying it. The characters are in tact, but not identical, and it is both fun and incredibly engaging as we see the past play itself out. Let’s hope that this continues longer than the original Hawkeye run, and that it actually gets its issues out on time and in full. This has a similar trajectory to All-New Hawkeye in that Warren Ellis came in and completely redesigned what this book could be, focusing on gorgeous design and giving it an epic cinematic feel. The first six issues are a fun and text-light run that focuses on feeling rather than plot points, and he is then followed up for the second arc by Brian Wood. His sensibilities fit perfectly with the design mode that was already created, and it simply ramps up further as this character is allowed to keep its complexity and frightful internal deliberation. The newest run was expected to falter without Wood, but Cullen Bunn is more than up to the task. This series continues to follow out the incredibly unique take on the comic that was established by Ellis, and it is going to stand away from anything else from Marvel. This is not the kind of thing that we thought we would like, but this little-weird-book-that-could has really carved out a space for itself. 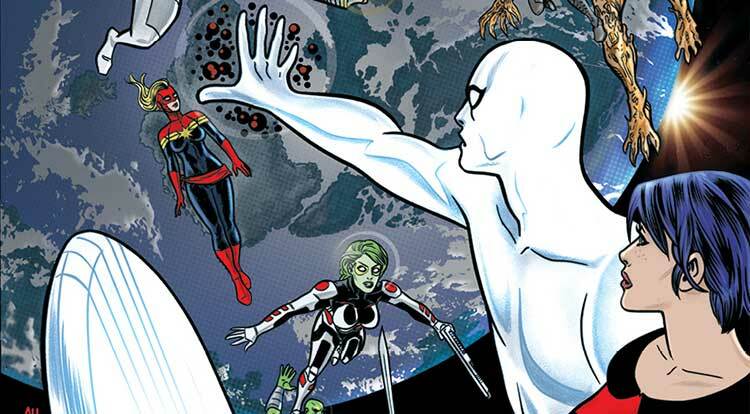 Silver Surfer from Dan Slott and Mike Allred, in possibly the most appropriate book for his style ever made, tells the story of Silver Surfer and his funny human companion as they adventure around the universe. It takes a silly tone as you meet weird aliens, interact with his partner’s family on the New England coast, and debate as to whether or not it is possible for her to really get down with a big silver dude. It is one of the weirdest books out on Marvel right now, and that is a great compliment where much of the Marvel Universe is so standardized around many of its more popular characters. This is a light read with a lot of strangeness, so get in the right mood to check it out. While a lot of great things are continuing to be said about G. Willow Wilson’s Ms. Marvel, sales are still on the low side. This draws on much of the energy that has always made Spider-Man such a success and tells the story of a young teenage woman coming to terms with both her powers and the coming adulthood. The fact that it is the first Muslim Marvel hero actually adds a great dimension as the book walks the line between ignoring and exploiting it. This adjunct series to the main Thor run has been a wonderful addition that digs deep into the mythological storytelling that made Thor: God of Thunder such a hit. Taking the Angela character that was originally from the Spawn universe and put her directly into the mythology of the Heven and Asgard. This series has been a fun and well written addition to the Marvel line-up, helping to cement Kelly Sue Deconnick as a comics superstar. The Carol Corps line-up as part of the Secret Wars event will be coming out shortly, so hopefully it maintains the same quality. Great list! I’m reading all of them except for Moon Knight. The constant creative team changes really soured it for me. The first team of Ellis, Shalvey, and Bordaire were great. I wasnt wild about the last team, but I like Bunn so maybe I’ll get the trade. I think Moon Knight is one of the few books where the art actually makes me pick it up over everything. I am curious to see how it continues when Marvel does their big relaunch in September. A book like that for me was the newest volume of Elektra. The story was just so-so, but Del Mundo’s art was spectacular.